Born in Yachiyo City, Kumamoto Prefecture. Was scouted when he won a karaoke competition, and moved to Tokyo after that. In 2008, debuted with “Minato Tazunebito”. His catchphrases are, “The newcomer with a sweet, lustrous low tone”, “The Hanikami Prince of Singers is born”. 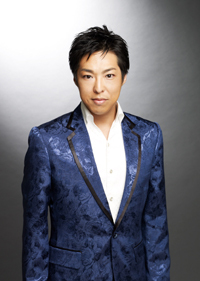 His resemblance to the professional golfer, Ryo Ishikawa, earned him the catchphrase. In 2009, released “Shinobi Ai”. In 2010, released “Minato Blues”. In 2012, released “Nakenai Onna”.